I know this is a little late, and will not be posted in time to help you decide what units to put in for, for the Wyoming draw. Up until now I really didn’t have enough solid information to feel confident enough to post my personal recommendations for the coming Wyoming deer season. But I recently received the info I have been waiting for, and now feel confident in sharing that info with all of my readers. Let’s just hope that this will help you realize that you made a great choice with your draw applications this year. Although Wyoming has been hit hard with the winter of 2011 (especially in region D and E) and the bad drought of 2012, the deer herd is stronger than most western states and there really aren’t any “bad” units. There are some poor units, but Wyoming is still the dream state for Mule Deer, in my opinion. Now let’s take a look at some units that I feel will be home runs and areas that may be a strikeout. My top recommended units begin with units 102, 101 & 117. I know, I know, if you had hunted units 101 & 102 in 2012 and 2013 and saw no deer or just does and young bucks, then you’re taking my name in vain right now. Because of the drought in 2012 and the warmer than usual temps in 2013, this unit was the exact opposite of what it is known for. These units are so dependant on the weather that you are always taking a risk applying for them. If the weather provides the right conditions, these two units will provide you with the hunt of a life time, and could be arguably the best hunting units in any state for Mule Deer. I fell in love with hunting the red dessert years ago, and it still has a special place in my heart. If you know how to hunt this area, you will find big mature bucks, especially if the weather cooperates. A couple other home run areas include unit 105 and Region G. These areas are a different animal than units 102 & 101. This is high country bucks. Be ready for a lot of hiking, glassing, hiking, glassing, and then hiking some more. Region G has traditionally supplied some huge deer and unit 105 has really been an incredible unit in recent years, and will only get better, in my opinion. Any of the Western units of region J will produce big deer and hold solid numbers of deer. But be prepared for an incredibly difficult hunt by being in great shape and ready to hunt above 9000 feet. A couple of sleepers that I think glide under the radar and are worth the extra effort are units 116 & 128, and units 79,80, and 83. All of these areas hold mature bucks and provide great public land access. Either way, if you are one of the lucky souls to be hunting Wyoming this coming season, consider yourselves lucky. Wyoming is a beautiful state that holds incredible hunting opportunities. The Mule Deer population is down, but it’s down everywhere in the west. If you are an out-of-state hunter applying to Wyoming and was considering holding on to your points another season but applied anyway, you made the right choice. Not only will you have a great hunting experience, but if Wyoming decides to cut their non-resident tags wayyyyy down, like they might for 2015, then it will join the ranks of places such as Utah and New Mexico for being nearly impossible to draw a quality tag. Good luck this year! Get out there this summer and do some scouting. Hard work will only help your odds at that trophy experience. One of the most frustrating things about hunting, for me anyway, is the inability of getting out and doing my scouting the way I would like. With work, being a husband and a dad I am left with very little time to do the ever important scouting. To scout effectively you seriously need to dedicate a minimum of four to six weeks during the year. This depends widely on what you are hunting and if it is a new area or an area you already know. Scouting is not cheap. The cost of lost work, gas, food, and of course better optics and other equipment. The every-day-hunter just does not have the time or the means to scout in an effective manner. So, what’s the answer? How do we learn an area? How do we find the time and the money to effectively learn an area, or learn the pattern of a buck or a bull? How do we know where the animals are and where they go if the temperatures are higher than normal or even lower than normal? Where should I go if there is four inches of fresh snow on the ground? There are a lot of things that one needs to know if you expect to improve your odds on that trophy, or even knowing where you can find something for the freezer. Well, the good news is that there is a way and in truth it will allow you to receive great information and more than likely, save you a lot of time and money. All one needs to do is go for a short drive to your local Fish & Wildlife Management facility. Come prepared with a map of the area you are wanting to hunt and the willingness to ask a lot o questions. In my experience the local biologists and law enforcement are very willing to answer your questions and help in any way. One sit down with a biologist will save you hours and hours of scouting. The game warden’s and biologist’s spend more time out in the same hills you are getting ready to hunt in a month than any individual could scout in a year. They will know where the animals are, they will know the quality of the feed, if and where there is water, the age of the animals, the buck/doe ratio or bull/cow ratio. I have had times when they would draw an ‘X’ on my map showing me “where they would go if they were me”. Priceless information is available year-round. All you need to do is pick up the phone or take a short drive. I currently have the personal phone number to the biologist that covers the area I will be hunting for Mule Deer this year here in Montana. He has asked me to call him at any time and if/when I am in the area, he would come out and meet me to help me do some scouting. Most of these people are willing to help and give us advise. Another simple way of doing some scouting from your comfortable recliner is on Google. Try it some time. Sit down with your laptop and Google a hunting area or county or canyon, etc. You will be surprised what you will find. Look at images in the search engines to get an idea of animal quality and genetics. Read posts on blogs from every-day people who recently hunted the area you are looking at. The information is endless and it is free for our enjoyment. Make a post on your Facebook account or find a hunting question & answer site and ask some questions on the area or areas you are hunting. You will be surprised with the answers you get back. Some of them will be very helpful. So, rather than wishing you had the time and/or money to do some scouting, take a chance on these tips. You never know, maybe you will find the best scouting method out there, and save some money in the process. Happy scouting and happy hunting. Good luck this year! Why are Mule Deer going down in number throughout the West? Is it over hunting, the loss of winter range, to many predators? I don’t think it can be blamed on just one thing. The Mule Deer is truly an icon of the West. The only way we can reverse what’s been happening is with the support of the Western Sportsman. 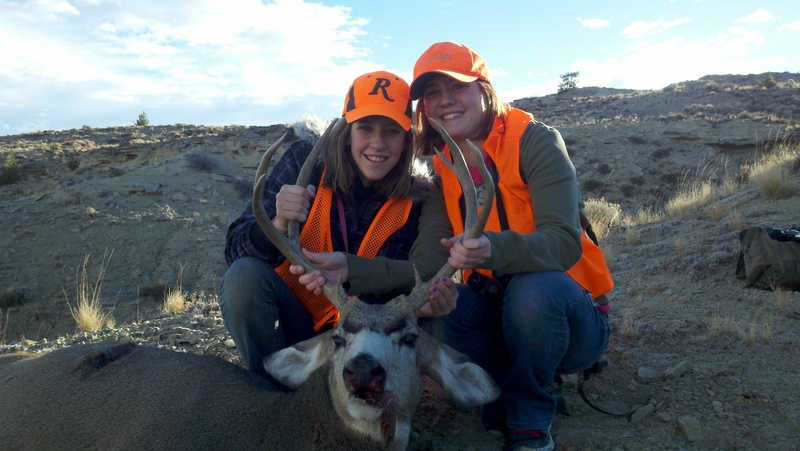 Join the Rocky Mountain Mule Deer Foundation. Attend and support local wildlife management programs. Take pride in the game we hunt each year. Because the simple truth is, if we don’t, nobody will. There are a couple of reasons I have decided to start a blog focused on hunting here in the Western states. First, I love hunting and I love hunting the big game animals found here in the Western states. Now, when I say Western states I am primarily talking about New Mexico, Arizona, Colorado, Utah, Nevada, Idaho, Wyoming, and Montana (listed randomly). I want this blog to be the source of entertainment, education, and some bragging rights. This brings up my second reason of starting this blog. I have a hard time finding information on hunting spots and/or information that is honest, and not motivated by anything other than because I love to hunt. I will provide specific information on areas, game, states, etc. No guessing or random info that I heard from Bill’s uncles roommates cousins barber. No broad sweeps of info based on 1950’s stories. You want to know about hunting Mule Deer in Utah on Boulder Mountain, then that is the info you will get. So, enjoy the blog, be active on the blog, and let me know what you want to see and read and I’ll make it happen…most of the time.